I have used Jamie Smith since last July. That was the best phone call I ever made for my horses. I am very happy with his work. He has the BEST customer service I think I have ever had from a Farrier. He is great with the horses and he has helped all three of my horses tremendously, especially my paint mare who went from shoes that were too small, no foot and no heel to actually having feet with heels under her now! She is still a work in progress but she is improving every session. Jamie is a great educator. Never minds a question and is happy to show you why he is doing what he is doing for your horses. I've used Jamie for 7 years now and I wouldn't use anyone else. He is reliable...always on time and if he is stuck in traffic, calls and lets you know what is happening. He has a great sense of humor. Is easy to talk to about your horses shoeing needs. You can ask all kinds of questions and he is more than happy to answer them. But the most important part is that he really knows what he is doing and does an excellent job. I never feel like he didn't pay close attention to my horses. One of my horses is now 35 years old. I started using Jamie 7 years ago when my horse had a very bad case of laminitis. When it was time to put him back into shoes, I decided I needed a different farrier than the one I had been using. I called a dozen farriers, questioning them about a lot of things. The only person who could answer all my questions was Jamie. Not only were his answers great, he did it with kindness and humor. Then when it actually came time to shoe my horse, he spent time on the phone with my vet going over what needed to be done. My horse is sound and his feet are beautiful. You can't find a better farrier. I have known Jamie Smith for approximately 3 years. 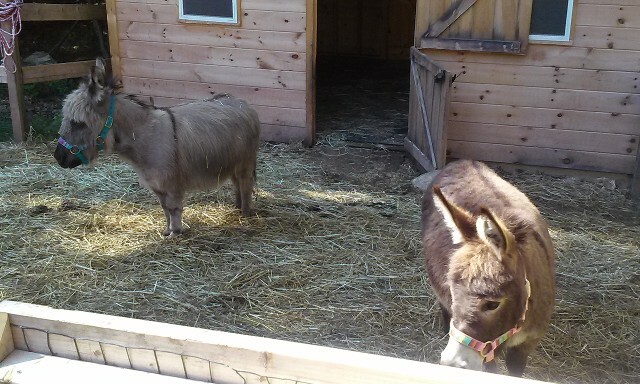 He has been trimming my miniature donkeys, Penelope and Scarlett, since then and my two miniature horses, Savannah and Annabelle, who I rescued in November of 2015. I cannot praise Jamie highly enough. He provides a reliable, professional service, is always easy to contact, and offers help/guidance in relation to my donkeys and horses foot health if needed. I am also very confident and trust him totally with my donkeys and horses and their feet are the best they’ve ever been. Jamie always has the donkeys and horses interests at heart and is one of the most kind and caring people..... I wouldn’t hesitate to recommend him to anyone! Jamie has been our farrier for a couple years. Our horses' feet were not in good shape before we found Jamie, but over the last couple years, he has made their feet look great! Jamie always spends quality time with the horses before and during his visit, and he never rushes through the job. He is always accommodating with our busy work schedules and is very respectful of our time. Jamie always calls/texts to confirm our appointment and has never been late in two years. Our horses clearly love "Uncle Jamie" and give him "two hooves up!" Jamie has been my farrier for 9 + years. Yesterday(Saturday), I went out to the barn at 2:30 to discover my horse had thrown a shoe. Disappointing, because I was signed up for a clinic Sunday morning. So I called Jamie. He was at my house before 3:30 and we are good to go! As far as skill goes, one of my horses has really difficult feet - a club foot with toe out, the other front wants to be low heel, smallish for his 17.1 size. Jamie has kept him super sound - way more than anyone predicted - through 3 training three day events. He's coming 12 and still going strong. I also foster horses for Canter, and he's done wonders for all different kinds of feet. I have used Jamie Smith for 2 years for my very busy lesson program and I am very happy with the way all my horses are going. I have had horses come in to my barn with lameness troubles or "tough case" feet and Jamie always gets them going in the correct direction. In particular, I found him to be very effective at therapeutic shoeing for horses with Navicular disease. I had one diagnosed and was very sore and Jamie got her sound and winning again and again! Jamie is an artist with hooves. I have been using him for about a year now and he is by far my favorite farrier. He is great with my 20 year old quarter horse, who had wonky thrush riddled feet to begin with and Jamie has made his feet even, super easy to manage and my horse moves much more balanced and smooth. Jamie does a wonderful job every time, he is extremely knowledgeable, experienced, super kind, patient and great energy to be around. I am unbelievably grateful to have him as a farrier, I can always trust him to do a spectacular job and I can never thank him enough. I would highly recommend him to anyone. I can honestly say that you would be very happy with Jamie as your farrier. I have always found Jamie to be reliable, well informed, funny, really good at what he does, but most importantly, kind to my horses. I have a 21 year old TB who had terrible feet and a 10 year old Morgan who tends to be a bit pushy-always testing to see what he can get away with. Not only do both horses have great feet now, but Jamie makes them feel safe, comfortable and calm. He always takes the time to talk to them, scratch their itches and show his true nature-kindness, compassion and a real love for what he does. Jamie is the real deal people. I would recommend his work to anyone and you would be happy to have him as a farrier.